interested candidates should apply on or before 20-10-2017. Assam APDCL/ APGCL jobs eligible candidates should send candidates should apply on or before 20-10-2017. 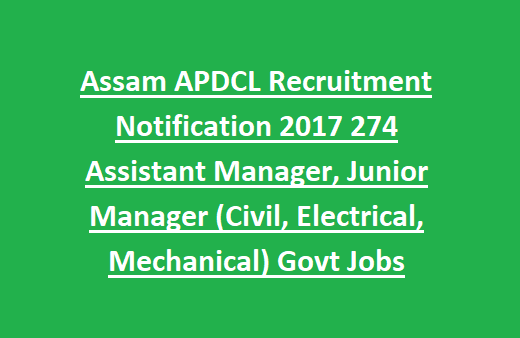 Assam APDCL/ APGCL jobs eligible candidates should send the application online. Assam APDCL Assistant/Junior Manager Vacancy Recruitment Notification 2017 Selection process will be based on the performance in the personal interview by the panel. For more information about the Assam APDCL recruitment vacancies, age limit given below. APDCL Assistant Managers: Age limit will be 21-38 years as on 01.09.2017. Age relaxation will be applicable for reserved candidates based on govt rules. APDCL Junior Manager: Age limit 18-38 as on 01.09.2017. Age relaxation will be applicable for reserved candidates based on govt rules. Education Qualification for APDCL Manager Jobs will be given in the below. 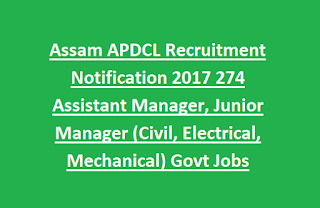 APDCL Assam Jobs applied candidates will be selected based on performance in written test & Interview for more selection details go through the notification. · Finally submit the application.